Zombie Run is a short 7 minute film made for a charity event for Barnsley Hospital Charity that takes place in October later this year. Is actually five minutes in length with a few minutes of credits, but the credits are stylishly done. 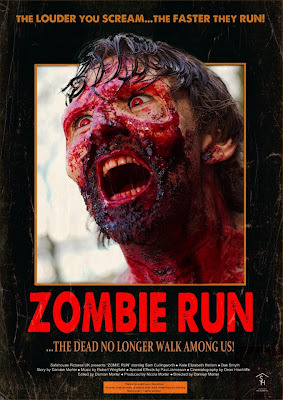 Two joggers out on a run in the country stumble across a blood soaked man eating a dog, spotting them he starts screaming which heralds the arrival of a whole swarm of charging undead ghouls. Pursued across the country paths can the lone survivor make it to safety? Shot in 8 hours the quality of this film is damn good. The zombies are of the running type but look very well made up, especially the dog eating one. Usually with cheap zombie films you get at least one enthusiastic zombie actor grinning with excitement (if I am ever in a zombie film that would be me!) but not here, the zombies all look very angry and messed up. Also features cool music that brought echos of 28 Weeks/Days Later memorable tune. The film as a whole reminded me heavily of 28 Weeks Later's iconic opening, the being chased by zombies segment actually more scary it could be said, just imagining what it would be like to be that survivor hunted down by mindless monsters is pretty chilling! Any improvements? Well for me personally there is a scene when the camera shows a close up of a dead dog, I would have had the dog twitching! Not really feasible though on a small tight scheduled film. The ending felt a bit off as well truth be told, unrealistic I felt. I loved this film, so much that I immediately re-watched it again right afterwards. If you want to check it out then head here: Zombie Run.